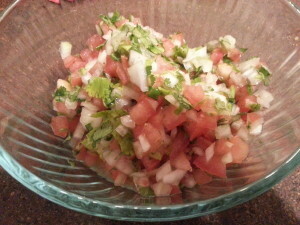 How To Make Pico De Gallo Easy Recipe Archives | Food blog! 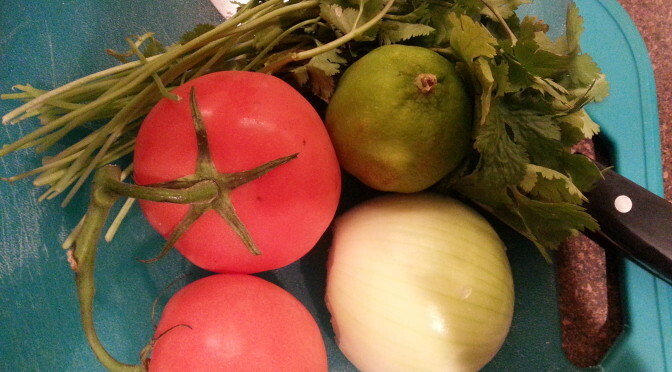 If you have 4 simple ingredients you can make Pico De Gallo with this easy recipe! Did you know that the other name for it is salsa fresca? Obviously by now you know that Pico is a Mexican dish the translslation for it means “rooster’s beak” and you can use it for various dishes in Mexican Cuisine. The best use for it however is as a topping for a multitude of different hispanic foods! Use it to dress your taco, fish, sorta, and even as a simple dip. This Mexican style salsa is served uncooked and with “raw” ingredients and will look like a simple salsa once finished. This image depicts the simple recipe used here! Chop onion and tomatos evenly (not too small) and place in a medium sized bowl. Chop cilantro and add to other ingredients. squeeze 1 lime into dish with all the ingredients. Toss the salsa and add salt and pepper to taste. Add juice form the other lime if needed. Give a final mix and serve !